Two rooms – a multitude of applications. We had to design an AV solution for a room which catered for the usual presentations and teaching sessions, as well as being capable of producing a real “cinema” experience. The room is fitted with 6 wall mounted speakers and 2 subwoofers built into the walls. These are driven by a receiver and DVD player to produce a powerful Dolby Digital surround sound. There is also a seperate PA system consisting of a wireless microphone, mixer/amplifier and distributed ceiling speakers. 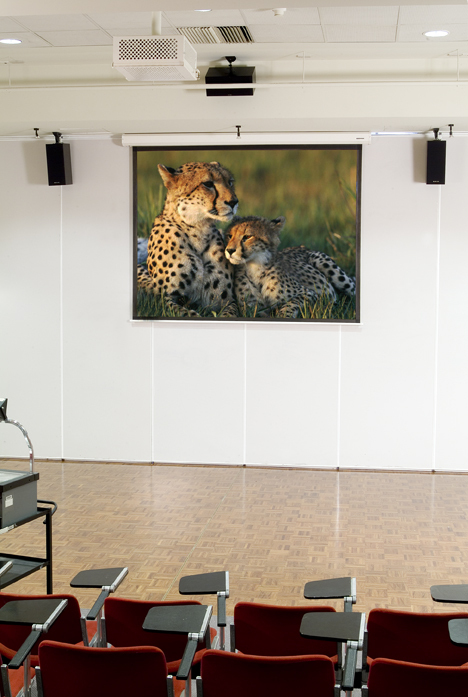 The ultra bright projector, which is housed in a secure bracket, projects onto a motorised screen which has the ability to display from both sides. The bi-fold doors behind the screen open up to a cafeteria area and the image is simply reversed at the touch of a button, to totally transform the system’s use! The entire system is controlled via the wireless AMX Touch Screen. This is custom programmed to Wesley’s requirements including the school logo! This controller was integral, as it transformed a seemingly complex array of technology into a simple interface for anyone to easily use.